If you or a loved one are disabled, choosing a firearm can be a hassle. 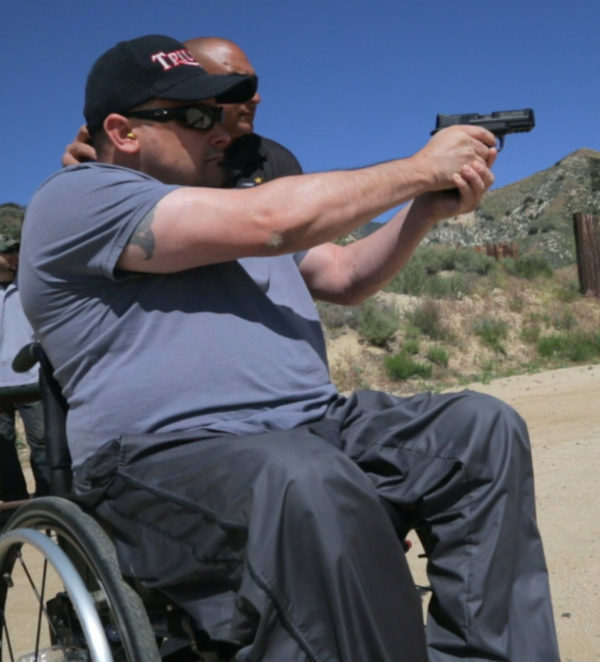 Over the years, I have helped dozens of disabled people find their way to the right gun. I base my suggestions on a study of the person’s condition and shooting field of interest. With a little help, its totally possible to shoot safely and accurately with most disabilities that leave you in control of your upper body. The purpose of this guide is to present my years of experience to you so that you can choose the perfect handgun, for yourself or for those that you care about. If you want to go ahead and skip on down to my list of recommendations, click here. When it comes to self-defense, the best gun for your needs is the one you can handle and have confidence in. Focus on the type of gun you can handle safely and with confidence. 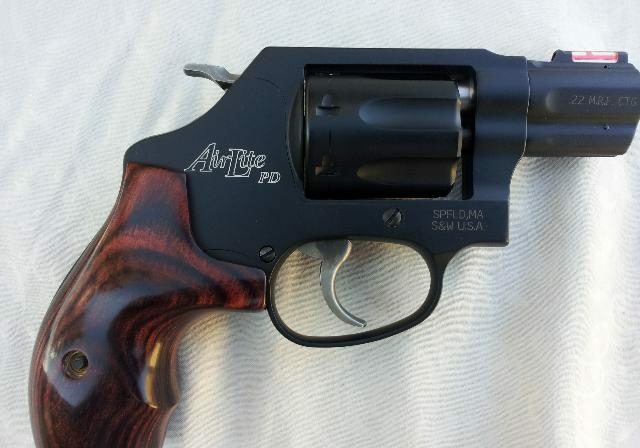 .22lr revolvers like this one are often a great choice for disabled folks looking to defend themselves. Good training and diligent practice will give you better results no matter what gun you use. Whether it is a revolver or pistol. Revolvers typically have less recoil and are easier to manage…there are fewer steps between pulling the gun out of the holster and pulling the trigger. They are also easier to clean and maintain than most semi-automatics. The easiest to start off with the is the .22 caliber revolver because it has the least recoil. Let’s say you have advanced muscle strength loss, lack of arm strength, or limited control. For these situations, you may be limited to a .22 caliber revolver firing .22 LR or .22 Magnum ammo. Ruger makes several very fine .22 revolvers. These pistols are suitable because of their smaller size and light recoil. They also offer a great opportunity to practice and train so that you can progress to a .38 Special standard velocity round. This round has more power, and the recoil is still light and easy to control. Next try the .38 Special + P or low velocity .357 Magnum ammunition (if you are planning to use a .357 Magnum revolver ). More powerful rounds may not be an option for many disabled shooters because of the hard recoil. You would follow a similar progression in calibers for a pistol. In this case, you would start with the .22 caliber semi-automatic pistol. Next you would move on to the .32 ACP, the .380 ACP, and finally the 9 mm. As you move up to the next more powerful cartridge, there will be more felt recoil when you fire the pistol, and you should always make sure you’re using something you can handle safely and shoot accurately. For more information, check out our handgun caliber guide. 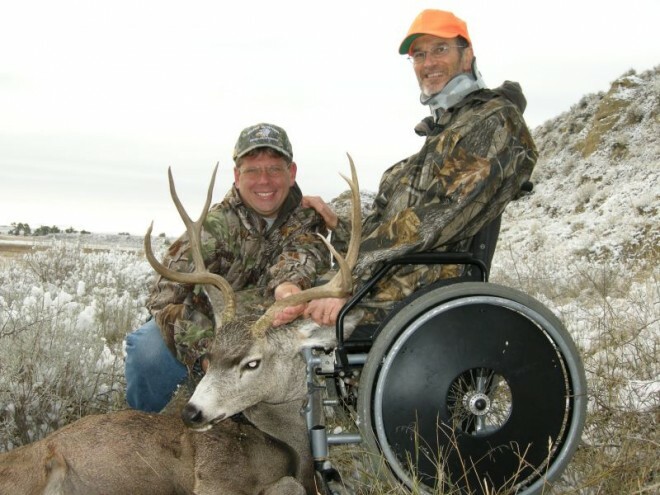 This hunter didn’t let being bound to a wheelchair stop him. 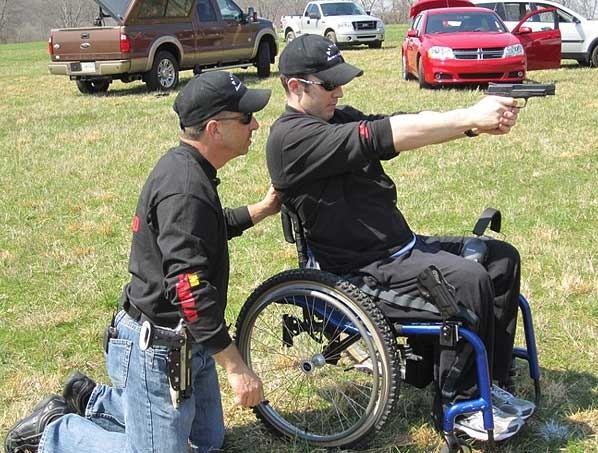 Disabled shooters that wish to hunt have options not available in a self-defense scenario. The two types of shooting are very different because of different accessories. In a self defense scenario, you won’t have your gun set up on a stand and ready to fire. A hunter can use stands and many aides that can give them better control of recoil and other problems. Here are some things to keep in mind when choosing a hunting handgun that works for someone who is disabled. If you use a revolver for self-defense, stay with revolvers for hunting weapon choices. 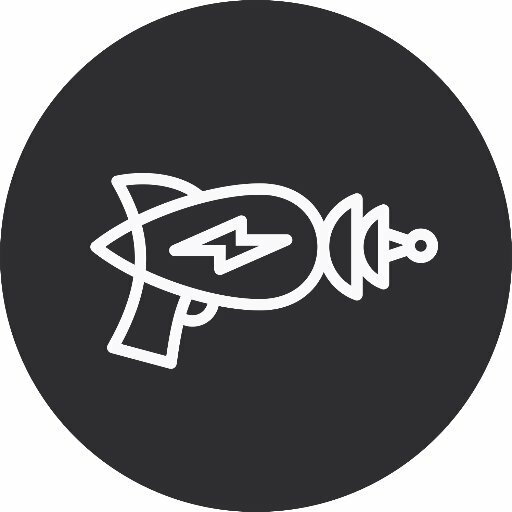 If you work better with pistols, then choose a pistol. When hunting, you can always use a stationary stand. It is easy enough to add a bench rest, portable table, or a handgun holding tripod to add stability and control. These accessories will greatly expand your caliber choices. For revolvers, you might be able to use the .44 Magnum, .45 Long Colt, or other large caliber hunting revolvers. With regard to pistols, the .40 caliber, 45ACP, 10mm, and .44 Magnum may be within your range. Accuracy, and being able to shoot in tight groups at different distances is crucial. Accessories can compensate for recoil and control. Only practice will improve your actual ability to hit and kill with the first shot. Note: You may find that you still cannot handle the rounds recommended in this list. If this is the case, only hunt for game that will be killed safely and humanely with the ammo type you can handle. 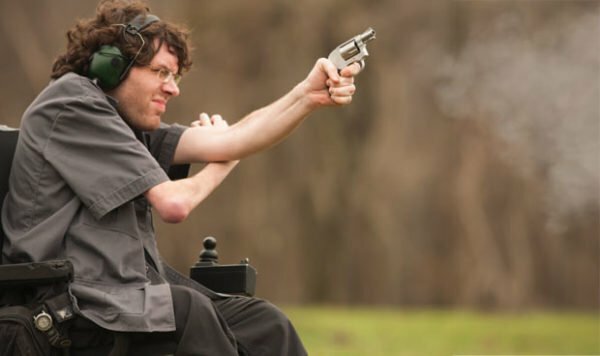 Shooting firearms from a wheelchair is entirely possible, and very common. Your local range should have no problems accommodating you. This is the time to have fun and shoot in a more relaxed atmosphere. Use this time to try handguns featuring different designs. You can also explore higher powered rounds in a safe environment. It is also a good time to work on scenario shooting with either paper targets or steel silhouettes. I recommend finding an accommodating local range and asking if they have any range officers or instructors with experience helping disabled folks shoot, as this is a great way to get the most out of your range time. These recommendations are based on years of experience helping all kinds of folks choose a handgun for themselves, regardless of ability level. Every one of these firearms should meet its intended purpose, and will serve you or your loved one well for years to come. First up: self-defense handguns that work well for those with a disability. As long as the shooter retains fine motor control and some upper body strength, these guns should work well to help keep them save. 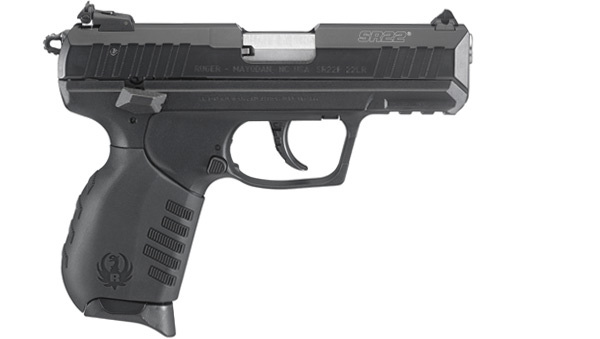 The Ruger SR22 is an excellent choice for those looking for a dependable, easy-to-operate handgun with little recoil. The Ruger SR22 ($399.99) is a DA/SA .22 caliber pistol, with 3.5 inch barrel, adjustable sights and rubber grips that you can also adjust. The capacity is 10+1 rounds, and it is very easy to pull the slide back. This, along with its inherently low recoil, makes it ideal for disabled shooters with weak hands and wrists. The Beretta Bobcat’s tip-up barrel makes loading and unloading easy for those who might lack the strength to rack a slide. The Beretta 21A Bobcat ($300) is a DA/SA .22 caliber pistol with a 2.4 inch tip-up barrel that takes 8 + 1 rounds. This barrel makes loading and unloading very easy for shooters with wrist problems. If you cannot pull back a slide, push the barrel release lever down and the barrel pops up to load or unload. The Ruger LCR ($500) is an 8 shot, .22 caliber revolver that has a 1.875 inch barrel length and a small frame. The trigger is smooth , and the recoil is easy to manage. Choose this gun if you would have problems aiming well, or have recoil problems due to weak wrists. Remember where you see the laser dot is where the bullet will impact, so this is perfect if you have less than stellar vision or problems holding your sights on target. The venerable Smith & Wesson J Frame is always a popular choice. Any J frame revolver ($449.00-$749.00) is an excellent choice, but this one in particular is DA/SA .22 Magnum with a 1.5 inch barrel, and 7 round capacity. The front sight is fiber optic orange and the rear sight is a fixed U notch. When shooting this revolver there is only a light recoil. 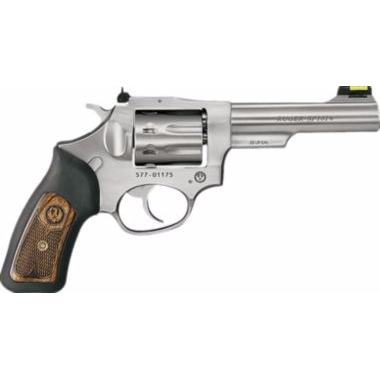 This revolver will work well if you have weak hands and wrists and can’t shoot .38 Special or .357 Magnums. However, you can get J Frames from S&W in many calibers, so its a good one to become familiar with. 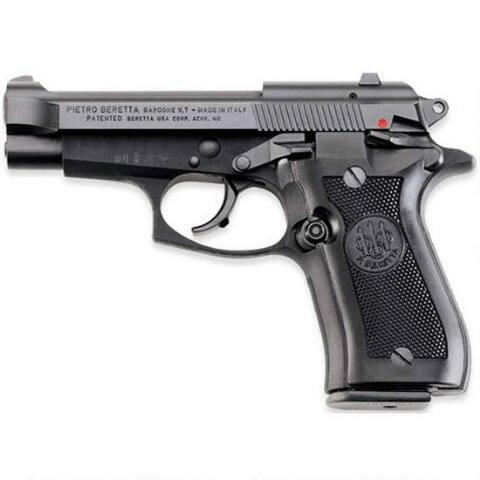 The Beretta 81FS Cheetah is a lighter-recoiling .32ACP variant of the legendary Beretta 92fs, aka M9. The Beretta 81FS is DA/SA, with a 3.8 inch barrel in an open slide design to help reduce weight, and a 12+1 ammunition capacity. The increased capacity gives you more shots before reloading. You get more fire power and still have the low recoil of the .32 ACP. This pistol will be a good choice for those shooters that are sensitive to recoil, and is prefect for those that are already familiar with the legendary Beretta 92FS as the manual of arms is very similar. 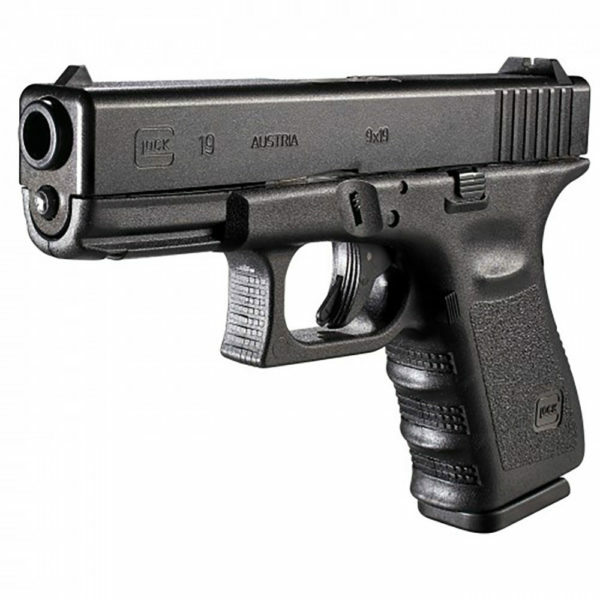 One of the most popular handguns in the world, the Glock 19 makes an excellent choice for self-defense. This popular Glock 19 ($549.99) is a DA only pistol with a 5.5 lb. trigger pull that comes with Glock’s popular Safe Action feature. It has a 4.02” barrel length, and fixed sights. This is a very dependable pistol and requires little maintenance. The Gen 4 pistol also comes with different sizes of interchangeable back straps. This pistol will work for disabled shooters with hand, wrist, and recoil problems, but you should exercise some care when shooting as the recoil can be a bit snappy if you aren’t expecting it. 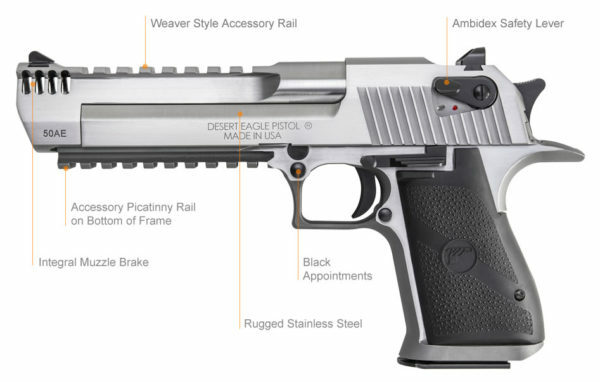 The Magnum Research Desert Eagle is a beast of a hunting gun…if you can handle the recoil. The famous Magnum Research Desert Eagle ($1,699+) weighs 72.4 ounces, which is a bit heavy, but reduces recoil. It has fixed combat sights and a scope rail to mount a scope or other sights for hunting. You can use it to hunt deer if you have good to excellent upper body strength even if you are in a wheelchair. The Glock 40 MOS comes ready to mount an optic for easier, and more accurate shooting. 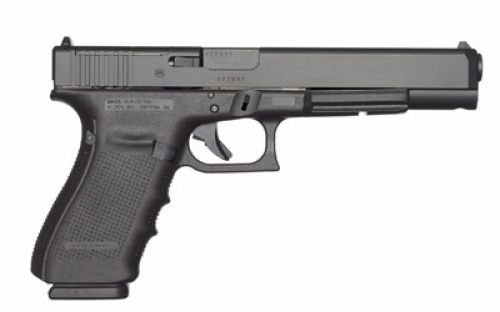 The 10mm Glock 40 MOS ($649.99) has a 6-inch barrel that increases velocity, and an ammunition capacity of 15+1 rounds. This large caliber semi-auto is suitable for killing whitetail deer or feral hogs. It can be used by disabled hunters with good upper body strength regardless of being in a wheelchair, and comes pre-drilled for optics to make shooting easier. The Ruger Super Redhawk is a great choice all hunters. 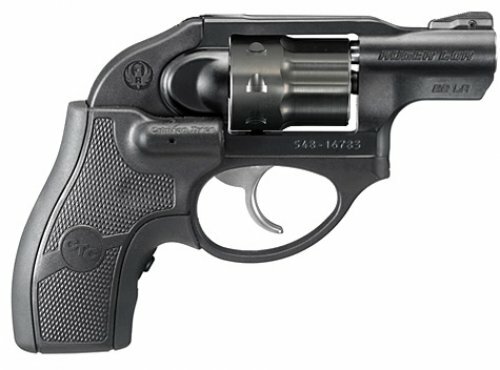 The venerable Ruger Super Redhawk ($1049.99) is DA/SA 6 shot revolver in .44 Magnum, with a 7 ½ inch barrel, adjustable sights, pistol scope and rubber grips. It weighs 59 ounces, which helps control the recoil. Use only if you have good upper body strength and no hand or wrist problems. In conclusion, there is no denying what your limitations are…but you don’t have to let those limitations keep you from using handguns. You must always put your main focus on what you can do and work with that, but there are more options available than you might think. Please feel free to comment on guns you have tried in the comment section below. I’d also love to hear any questions you may have about choosing a handgun for your specific needs. A .327 revolver loaded with light .32’s is a good step between .22 and .38. It also has the ability to fire magnum rounds.